As Penn State was on the verge of hiring Louis J. Freeh to lead its internal probe of the Sandusky scandal, trustee Ken Frazier asked the former FBI director one last question. Even after a personal interview and a week of vetting by university and state officials, Frazier wanted to hear it from Freeh himself: do you have any conflicts of interest that would affect your judgement? Within hours after Penn State announced he was hired, a Philadelphia newspaper reported just the opposite. Freeh was the former general counsel to MBNA, the former credit card company with strong ties to Penn State and a senior executive who sat on the board of the Second Mile. Nobody seemed to mind Freeh’s omission. The former federal judge immediately began his investigation that would end with a scathing report about how university officials handled reports of child abuse ten years earlier. The e-mail is one of several that sheds new light onto how a small group of university leaders navigated the early day of the scandal. They describe how Frazier and former secretary of education Ron Tomalis – the leaders of a trustee’s Special Investigations Task Force – picked a chief investigator for the most important task in the university’s history while regularly consulting the governor and other state officials. Their actions were contained in more than 500 pages of records that were recently released in response to a Right-to-Know Law request. The state Office of Open Records allowed about 150 pages to be withheld. That decision is being appealed. Gov. Tom Corbett’s administration became involved in Penn State’s internal investigation as early as Tuesday, Nov. 8, when the Pennsylvania Office of General Counsel sent Tomalis a list of firms it wanted Penn State to hire, according to a list of e-mails provided by the Department of Education. Later that day, the board announced its decision to form a task force to investigate the Sandusky scandal. But it wasn’t until the Board of Trustees’s regularly scheduled Friday board meeting that Tomalis and Frazier were named the committee’s chairman and vice-chairman. What it didn’t say was that both men had already been working for several days to name a firm to investigate. Behind the scenes, pressure was mounting to name the other task force members after a congressman wanted to get involved in the investigation. Philadelphia-area Rep. Patrick Meehan had publicly called on the U.S. Department of Education to investigate Penn State for Cleary Act violations earlier in the week. The next day, federal investigators dispatched a three-page letter demanding access to university records and personnel. But Pennsylvania’s congressional delegation wanted more. They had decided to seek a seat on the task force, and were on the verge of sending a formal request to Penn State, Meehan told Frazier. Frazier convinced Meehan to help put a halt to the plan. With a congressional invasion put down, the pair focused their attention on choosing an investigative firm. Only two names on the Corbett administration’s list were still being considered: former U.S. Secretary of Homeland Security Michael Chertoff, and former FBI Director Louis J. Freeh. Other firms wanted Penn State’s business too. Within hours of being named Chairman of the task force, Frazier was “inundated” with offers from firms to conduct Penn State’s investigation, according to an e-mail. But none of the interested firms were considered, the e-mails show. The men honed in on Freeh and Chertoff. By the time he returned home from the Friday board meeting, Frazier had chosen his favorite. “Chertoff is at the Covington firm which has much greater resources at its disposal,” Frazier told Tomalis. Tomalis agreed, but urged Frazier to keep an open mind. “I think we should talk to both of them though to see what additional resources Freeh could marshal if need be,” Tomalis wrote. Before they had decided between Freeh and Chertoff, Frazier and Tomalis had already decided that the lead investigator would work directly with the attorney general. The e-mails don’t say they sought the advice of anyone other than Corbett. By Monday, the pair had interviews scheduled with Freeh and Chertoff. They met on Thursday, Nov. 17, at Merck’s corporate office in Washington, D.C.
After talking with the candidates for four hours, Frazier’s preference had changed. “Our inclination is to go with Freeh,” he wrote in an e-mail to board Chairman Steve Garban, Vice Chairman John Surma, General Counsel Cynthia Baldwin and Tomalis. Tomalis sought the governor’s thoughts on their choice. “He is ok with either candidate and only advised to go with the one who can dedicate more time,” he reported to Frazier. Nobody questioned their choice. “Trustee Frazier, I trust your judgment as to the choice of counsel and the timing of the announcement,” wrote Dan Hagan, the chairman of the university’s Faculty Senate. “I completely endorse your choice of Louis Freeh and also your overall approach Ken,” wrote Trustee Karen Peetz. With task force members on board, Frazier decided to pull the trigger. On Friday, Nov. 18, 2011, Penn State officially hired Freeh, Sporkin and Sullivan to lead its historic probe of the Sandusky scandal. 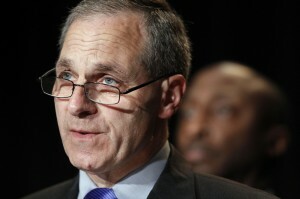 Three hours later, the Philadelphia Inquirer reported on Freeh’s ties to MBNA. Over two years ago, I smelled something fishy when Freeh was selected. How can any group determine the scope of a project, determine a budget, create a proposal, bid the project, receive and evaluate the responses and pick a firm in less than a week. That was the moment the ‘Red Flags’ went up for me. No wonder Frazier was so defensive on Freeh and defending the reports findings. He was the one who chose him. Lips moved. Lies came out. And the beat went on. Great work, Ryan. I haven’t been able to read all of the emails, but it appears there was direct communication between the task force and AG Linda Kelly.